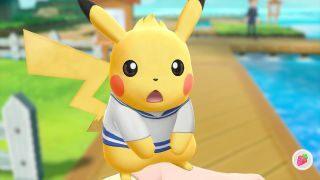 Pokemon Let's Go has only been out a week, and the Limited Edition Pokemon Let's Go Switch console bundle, which comes complete with the Pikachu version of the game and the amazing Poke Ball Plus controller, has seen a few Black Friday Nintendo deals happen already. But none quite as good as this. Currys is offering the Limited Edition Pokemon Let's Go console bundle for just £329.99, and that's including the game and the Poke Ball Plus, which is £399.99. That's even cheaper than the earlier Amazon and Argos deals of £339. Compare that to the price of the Limited Edition Pokemon Let's Go Eevee bundle, which is £399 right now, and you'll know that this is quite the incredible saving. So you better move fast if you want it. If that runs out, both the Pikachu and Eevee versions are still available at £339 from Argos, so don't fret. This is either one of the best Cyber Monday Nintendo deals ever, or a wonderful typo, but the deal is live right now, working and I'd be very surprised to see this particular Limited Edition bundle for less that this price this Black Friday. So move fast if you want to nab it for yourself, or a very, very loved one.